Congratulations!!! Very well done!!! There is no doubt that you deserve it!!! We are new in town, as you know. 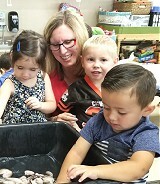 Before we chose MCDC we visited 12 different daycares in the region (Napa, Fairfield, American Canyon, Vacaville, etc.)... Crazy!!!! After each visit we were very worried about the decision that we would have to make...We couldn't find the "right place". I remember one afternoon during our scouting trip (some weeks before we moved to Vacaville), Nathan and I (and Maria Andrea) were sitted in Chili's, "trying" to eat something and we were just OUT...we didn't have an answer, or a clue, about which daycare or preschool Maria Andrea would be attending. Since both of us work, we definitely were looking for a daycare option. Besides, she experienced being in a preschool in TX, and it was one of the most wonderful experiences in her short life. We didn't have friends or family to give us advise or recommendations...we just were trying to find the best option for Maria Andrea's formation based on our feelings and knowledge about education. That day we visited MCDC. Miss Lisa welcomed us, and showed us the facilities. She introduced us to the team. We were shocked (positively shocked). MCDC was the 13th option in our "preschool to visit" list. We were 100% sure that a place like this was what we were looking for. Not only for the facilities, but for what we could see in the team. Nathan used to work for elementary and middle schools in Mexico. I am partner and currently work for the first in-company daycare system in Mexico as well (actually we operate 8 daycare centers with the NAEYC standards, so I am familiar with some practices here in USA). The most difficult thing that I have to deal with every day is to find people who truly love what they are doing... Regardless of infrastructure, curriculum, operational standards,....if we don't have people with a true vocation and dedicated to the kids, we are nothing. That is what we have found in MCDC. You can tell you truly love what you do!!!! Thank you for taking care of Maria Andrea and loving her so much. She is so happy at MCDC!!!! Special thanks to Miss Margaret, Miss Vicky, Miss Gloria, Miss Ari, Miss Susana, Miss Lisa.